Completing a duathlon has been on my list for a while. Last Sunday I entered my first, and now I’m looking for the next! 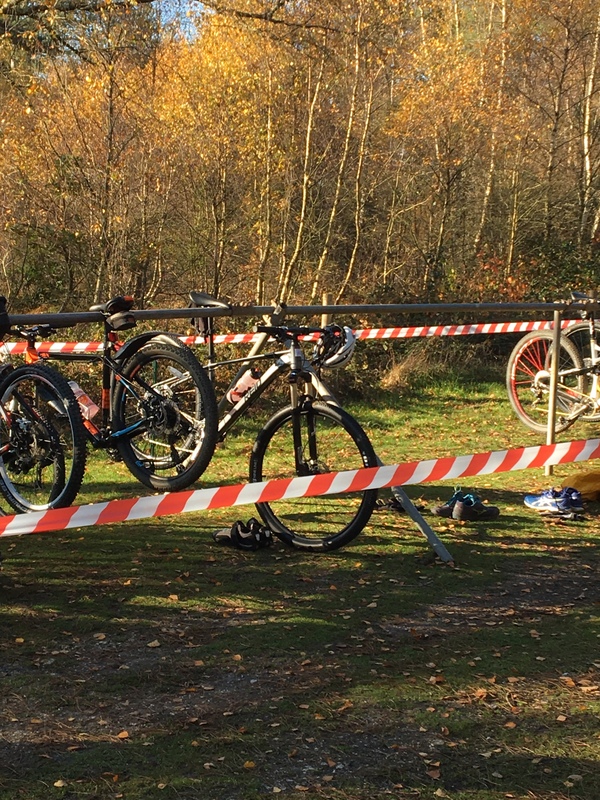 My chosen entry to the world of multi discipline racing (read stumbling) was the TriPurbeck Sika off road Duathlon held just outside of Wareham, Dorset, on the Bere road. I found the event online after searching for duathlons in Dorset, couldn’t have been simpler! although having only done this at the beginning of October it didn’t give me a lot of time to get ready. My running was really out of shape, I had never completed any mixed discipline event, and the bike I had wouldn’t have made the event any easier. I had to sort it all out pretty quickly! In a duathlon the event is broken down into three parts (five if you include transitions? ), first you run, then its onto the bike, and finally back onto your feet for the final run. Quite a tough mix and a mostly unknown quantity for me. As with most things though it was a case of mind over matter and I needed to know how I would fare in a full race distance, so did exactly that. Woke up on the first Sunday morning I had spare and completed a race distance. I’ve just made that sound really easy, it wasn’t. Despite the fact I deliberately slowed it all down. I ran nine minute miles for the first run, then straight onto the bike. Even though I felt fully warmed up my legs took a while to come in, its a weird sensation when you feel like you can go flat out but your legs didn’t get the memo! Then there was the final run. I had to check I wasn’t actually wearing concrete shoes, my legs felt solid, it was more of a fast shuffle! I had some work to do. Me being me I wanted to give myself the best chances on the day, I read loads of duathlon posts on the internet and set myself up with a few hacks. These were in the form of training plans, kit selection, transition setup, and mid race fuelling. Training wise the biggest hack was brick training, this involves multiple discipline swaps in a row to get your body used to switching. This really helped to make transitioning easier, maybe it was all a mental boost but hey sometimes that’s what its all about isn’t it. I also practised transitions as well. This may sound silly but putting on a helmet, removing running shoes, putting on cycling shoes, and then running with your bike is a bit of a task. Especially when trying to do it in under a minute! And that’s not the hardest one, try doing it in reverse with a running dismount off the bike! practice here pays off. Then there was the kit choice. There was a mix of info on this on the net regarding duathlons with some saying run in cycling shorts and others say not because it feels like running in a nappy. I tried running in bibs and had no issues, but they were a pair of entry level DHB meaning fit wasn’t so pro cut (ie only comfortable in the head down cycling position) and the pad was relatively thin. Those paired with a good slathering of chamois cream and I was fine. The final kit hack I found was stretchy shoe laces. I bought two sets, one set for my trainers, and another set for my cycling shoes. I chose two different types because of how they would work with each shoe, click the links to see them, but they were so cheap you shouldn’t be without them. They make shoes off shoes on so fast and fumble free in transition. The final bit of advice I found was for fuel and hydration, everyone online was saying save it for the bike as its the easiest time to drink, and it was pretty good info. My plan was to load with fluids beforehand and have a caffeine gel ten mins before the start, then on the bike I would have a large water bottle with hydration drink and another energy gel. That would be enough for roughly two hours of hard work. Only one thing left then, the bike. 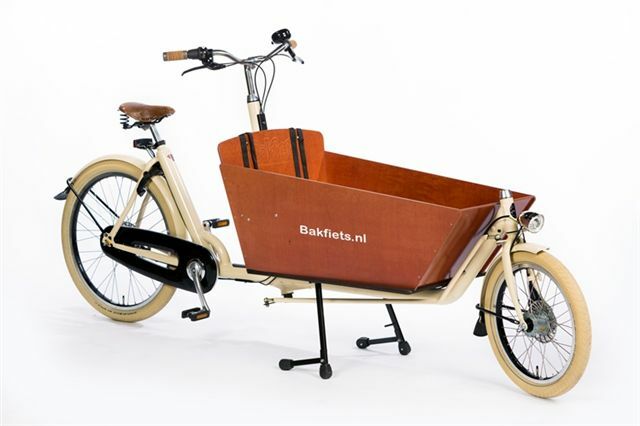 Now I completely lucked in on this one, I had recently been contacted by Reid Bikes and asked by their social media guru Kyle if I would like to try out some of their new range. They had the perfect answer to my race bike needs, their new Argon 29er, so I gratefully accepted their offer as the Argon would be just the right bike for my first off road race. I managed to get out on the bike a few times for some training and got to grips with it very quickly. So that was prep all done, whilst I like knowing what I’m letting myself in for, maybe I was taking things a little seriously though eh! So how was race day? in a word, fun. I arrived pretty early as I was unsure of etiquette for setting up transition and wanted to watch a few other entrants first before I started racking the bike. I was actually very early and managed to get to the event just before the juniors started competing. A perfect way to learn how I needed to race! The kids were very impressive, all went great guns and there were some pretty impressive times, its great to see kids getting into this sort of thing. When they had all finished and cleared their bikes the super keen adults (me included) were able to enter the transition area. I racked my bike midway and set my helmet and shoes up, I was ready to go. The last thing before the off was briefing and this was called ten minutes before the start, it covered transition rules and race routes. Briefing over, it was time to start. Out of the gate and into the first 3.8 mile run I did my usual excited effort to try and keep up with the front runners. This lasted about a mile and I had to back off, settled into my normal 8 minute mile pace and unfortunately started to lose places. The run course was a loop on forest gravel tracks and quite undulating at start and finish, hence the initial sprint and slower finish! It was then onto what I saw as the most daunting part of the event, transition, but actually the practice had paid off and it went really smoothly. Helmet on, shoes changed, bike unracked and I was off on my first of four laps. This part of the event went well and played to my strengths, I made some good time catching quite a few people. 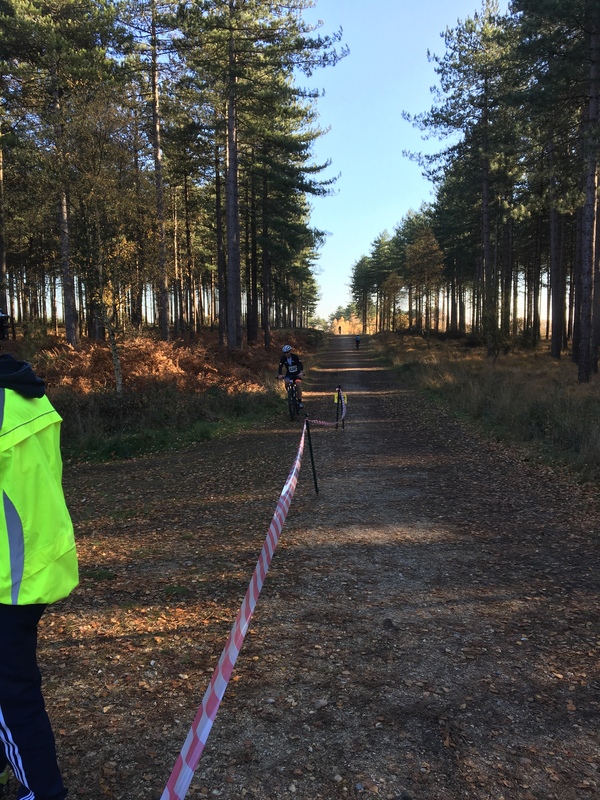 The bike was fast and fitted the terrain very well, so very grateful to Reid for it, the tyre choice was perfect for the crushed gravel and sandy heath land tracks. I’ve not ridden a 29er before and the extra speed from the larger wheels is noticeable, I was expecting slightly odd handling but the Argon was nimble and railed most turns. 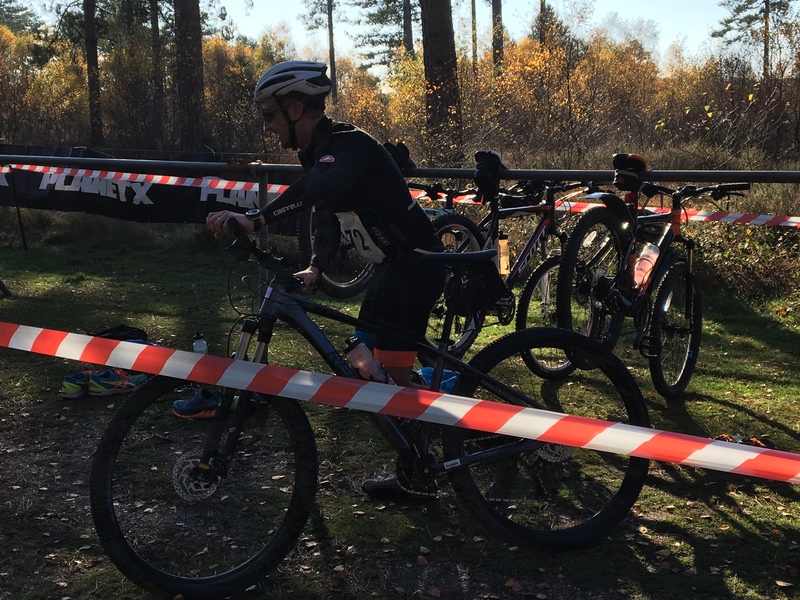 Catching people was relatively easy as there were a few difficult sections on the course but they caused bottlenecks, this meant picking a passing point was tough and then getting past it involved a sprint. Essentially every time I passed someone it emptied the tank a little faster, coupled with that was a really nasty little hill close to the end of the lap, and after four times round my legs were starting to cramp pushing top the top. I saved my mid event hydration for the bike accompanied with a halfway gel and finished the bottle on the last lap, but maybe this wasn’t enough fluids. Second transition was here and this time it was with a running dismount. Unclipped both pedals, swung my right leg over and jumped off. Smug dismount of the day, I felt like a pro! Racked my bike, ditched helmet, swapped back into my trainers, and started the second run. This time an out and back 2 miler. Immediately my calves cramped and I couldn’t run, I had to stop and massage both legs to get them to relax, it was very painful but they freed up enough for me to shuffle on. My pace dropped to 10 minute miles and that final 2 mile run felt like an eternity, losing nearly all the places gained on the bike. Determined to finish without walking I pushed on and my legs improved slightly, 20 minutes later I crossed the line. 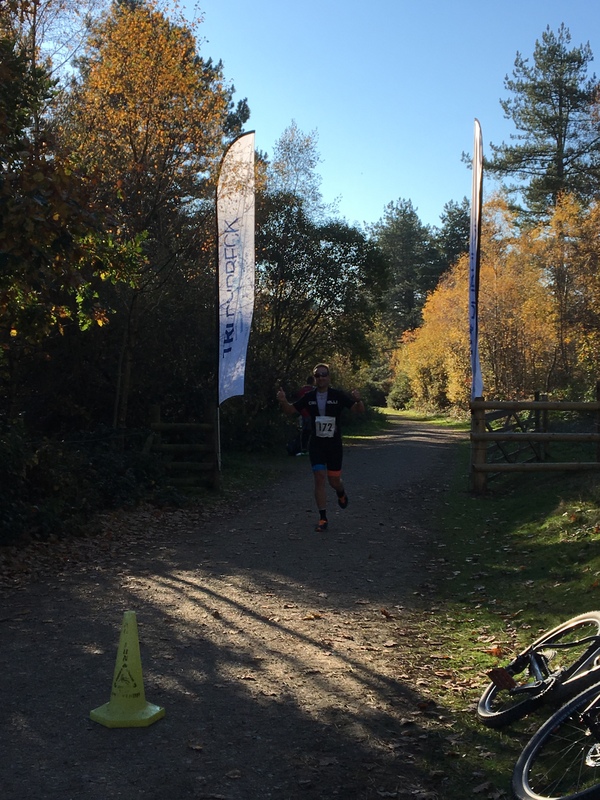 I had complete my first duathlon, I was over the moon. The Sika duathlon was a great introduction to multi discipline racing and a great step on my dreams of a triathlon (I really wanted to type iron man there, but that’s a goal before 40!) entry. The event had a great relaxed atmosphere with people open to helping newbies like me into their sport, you just need get stuck in and to chat to them! At sign on they were more than happy to guide me through it all, after all new blood is what keeps it all going. I learned a lot about my personal fitness and how I need to improve my running to get closer to the front of the field, and that I need to manage my pace and hydration better. Some fantastic conditions and a great course made the day, I loved it so much that I have signed up for my next one. Anyone else doing the Rempstone Roast?? if so, i’ll see you there! Cyclists if you fancy a challenge? Runners want to test yourself on a bike? find yourself a local duathlon and get involved, you’ll have a blast.